By the author’s own claim, “And a Bottle of Rum: A History of the New World in Ten Cocktails” is not an effort to claim that the history of America was defined by rum, so much as it’s an effort to share just what that history was, and to do so through the prism of rum as it reflected the times. From the early days of grog and flip, to the more recent history of Mai Tais and Mojitos, rum has always been a product of the current culture, and methods of its consumption changed accordingly. The most immediately noticeable quality of Wayne Curtis’ writing is that it’s friendly and unpretentious. While his material is thorough and well-researched, it’s also clearly written by a fella that’s spent some time in bars, sharing stories, sharing jokes, and (almost certainly) occasionally woken up in puddles of his own drool. While the stories within this book aren’t (for the most part) his own experiences, he shares these stories with an easy-going wit that makes this book a delight to read, and difficult to put down. Rum has a varied history. Having spent time as the fuel of freedom, the bane of polite society, and the elixer of poets and pirates alike, it’s found occasional acceptance amongst high society as well as the dregs. Throughout the pages of “And a Bottle”, you’ll observe rum’s affairs with Hemingway via the Daquari, the Andrews Sisters via Rum & Coke, Paul Revere via Flip, and let’s not forget Don Beach and Trader Vic – pioneers of the Tiki revolution and the Mai Tai. These and more make for fascinating reads, and I wish I could tell you more. But to do so would be a disservice – Curtis’ own manner of storytelling is both entertaining and informative, and any attempt to summarize would be akin to trying to share a really great story some guy told at the bar last night – I could try to repeat both the tale and the humor, but ultimately it would fall flat, and I’d have to end with, “well, I guess you had to be there.” Fortunately, this wasn’t a bar story, it was a book. As such, you CAN be there. Just go buy a copy and read the damned thing. 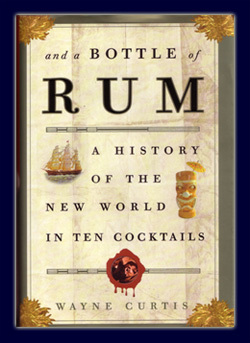 Rum lovers and history lovers alike will not be disappointed – I promise. This entry was posted in Books and tagged curtis, dark rum, history by Bilgemunky. Bookmark the permalink.